A blog is a great way to share your ideas and get feedback from others and SharePoint Online, part of the Microsoft Office 365 suite of production, makes it easy to share via a blog. It’s also ideal for documenting step-by-step instructions for a variety of topics. This is handy when co-workers ask for instructions to add a YouTube video, for example, to a SharePoint site. Instead of repeating and resending the same information, you write the instruction up as a blog so you can share the information more than once. SharePoint Online’s personal site comes with a personal blog already preconfigured. You can access the blog from the Content section on the My Profile page. Click the Content tab from your profile page. Under Recent Blog Posts, click Create Blog. You are taken to your blog site, which is a subsite or child site in My Site. Click Create a Post from the links below Blog Tools on the right-hand side of the page. 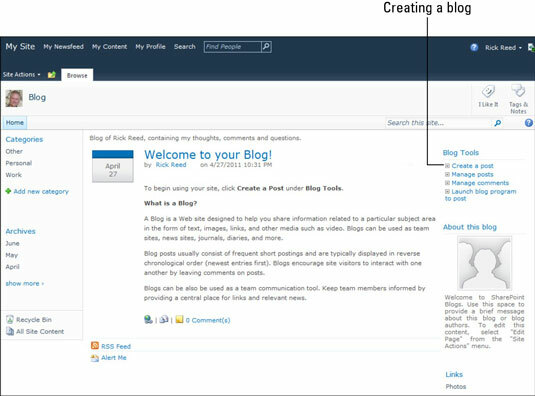 From the Posts – New Item window that appears, enter the title of your blog, add your blog content under Body, select one or more Categories (optional), and enter under Published the date you want your blog published. Click either Save as Draft (if you want to finish it later) or Publish. After your blog is published, others can share your blog, send it as a e-mail, and leave a comment. SharePoint Online lets you set permissions on libraries, lists, blogs, and items within your libraries, lists, and blogs. This means that you can set permissions on your shared documents library for 50 people and, within that document library, restrict permissions to a file to just 10 people.